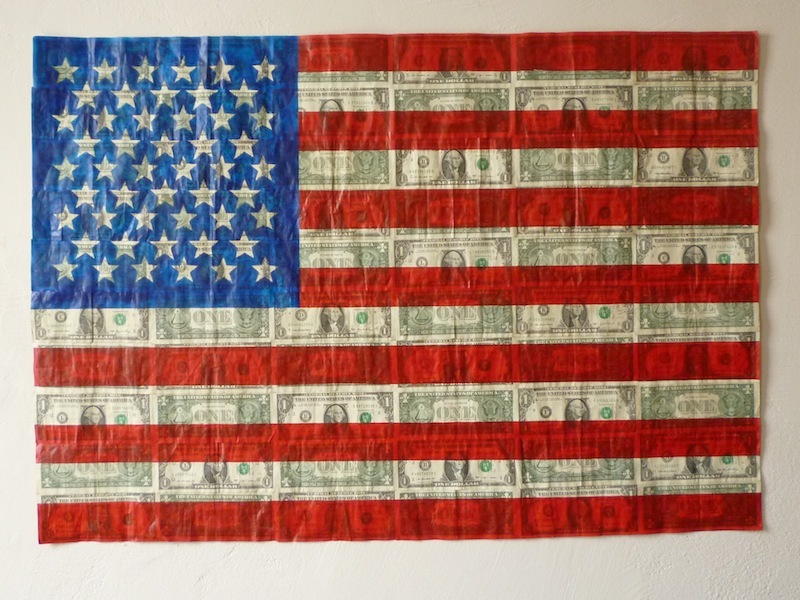 In God We Trust (Novus Ordo Seclorum, A New Order of the Ages) 2012, acrylic on 60 dollars, 35" x 25"
I took the word "one" and found its synonyms from the Encarta World English Thesaurus. I then found the synonyms for those four words and continued the exponentially growing process of finding synonyms until I had five generations of words with approximately 1300 words total. In addition, I presented a history of the written word "one," as it develops through calligraphy, typewritten text to handwritten post-it notes. The synonyms literally evolve through each generation as they are presented down the wall. 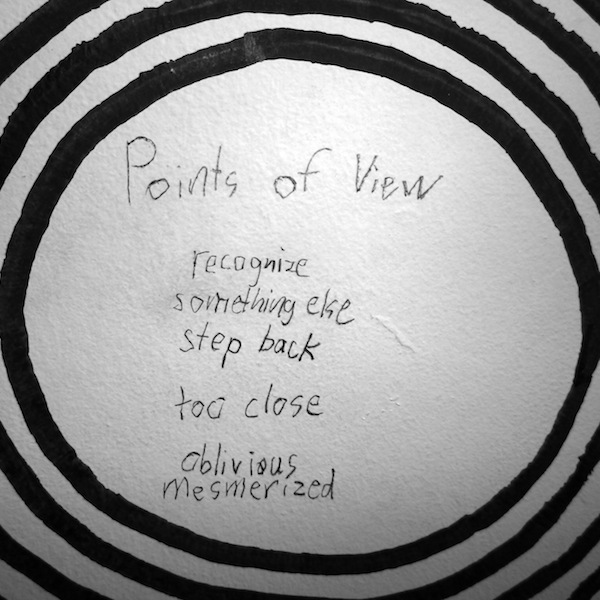 The words are written, printed and typed from the top of the wall to the bottom in the following media. 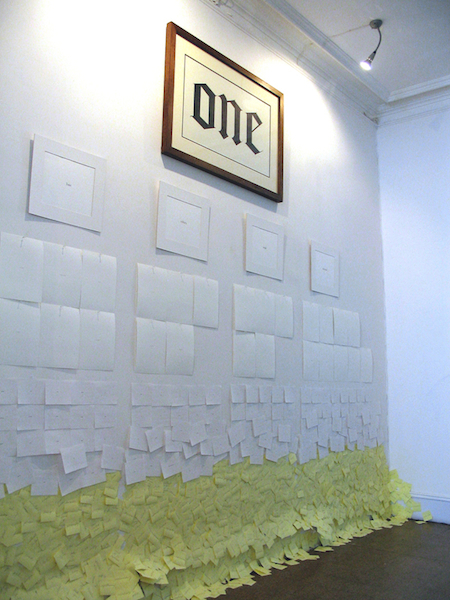 The first row is the word "one" hand written in calligraphy, the second row has four words printed using a printing press, the third row is typed with a typewriter, the fourth row is typed with a computer and the last row is hand written on post-it notes. Calligraphy was a beautiful and time consuming process, the privilege of an elite, educated few. Each subsequent generation of text presented on the wall took less time and energy to produce, allowing for the faster circulation of ideas. The exception is the post-it notes, which return to the process of hand written text. 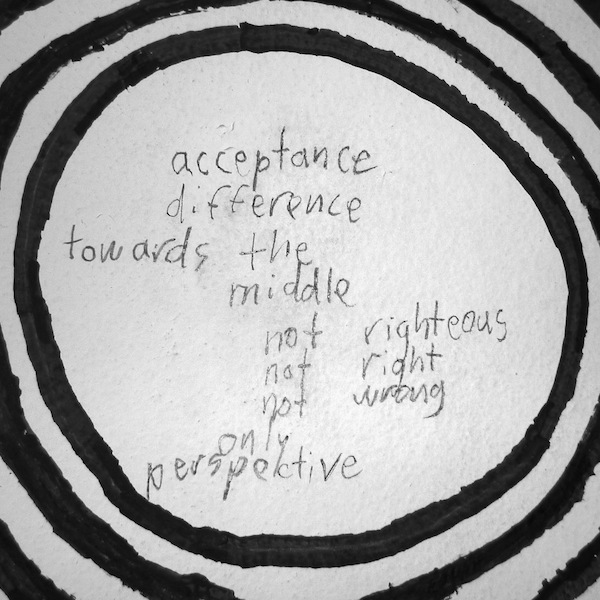 Points of View (Towards Acceptance), 2012, pencil and marker on drywall, 9&apos; x 19&apos; x 8"
The concentric circles on the wall highlighted the text that was written in the center of the circles. 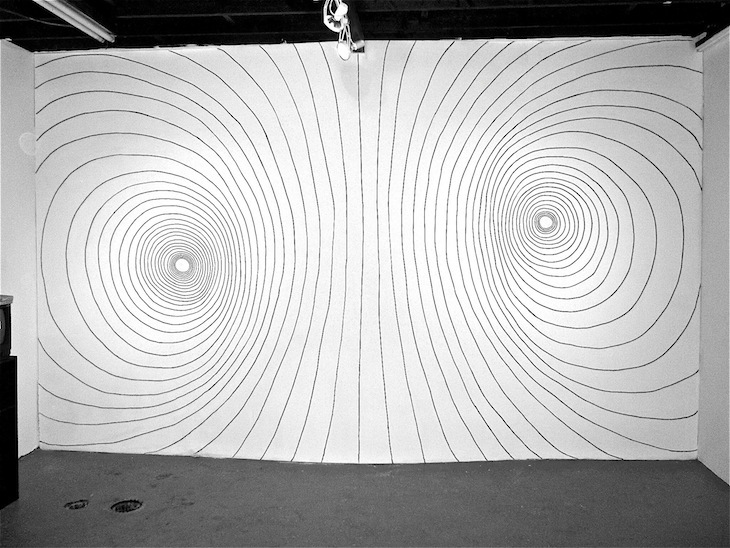 the wall so that it curved outward.